Children are full of questions unfortunately there’s not enough hours in the day to get through them all. 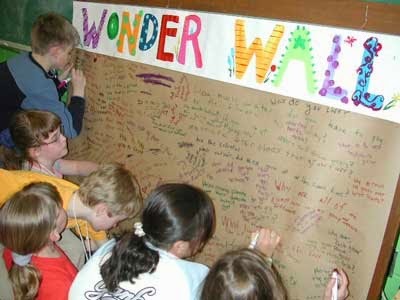 Therefore I create a wonder wall. If a child has a question he/she gets a piece of paper (already cut out- coloured- makes for a better display). They write their question on a piece of paper. Once a day you can find the answer to the question or it can be used by the early finishers- use a book/computer to find the answer to the question.